The stereo cabinet contains all of the components for my audio system. The components are largely from the late 70's when I was selling audio gear. The equipment was chosen for performance (not looks) and was a bit of an unruly heap in the living room. The cabinet is designed to provide ample air flow and easy access. The gap around the top borrows from both Eastern and Craftsman styles. The back panels are easily removable and held in place with magnetic catches. 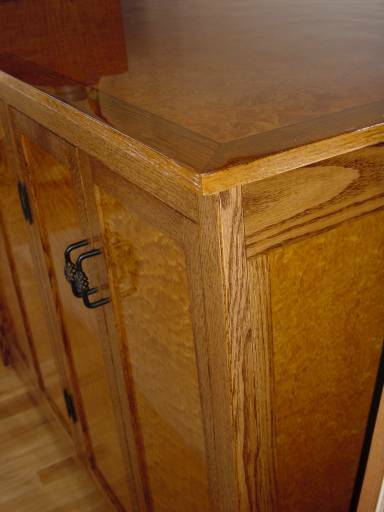 The frame is made with quarter sawn red oak. 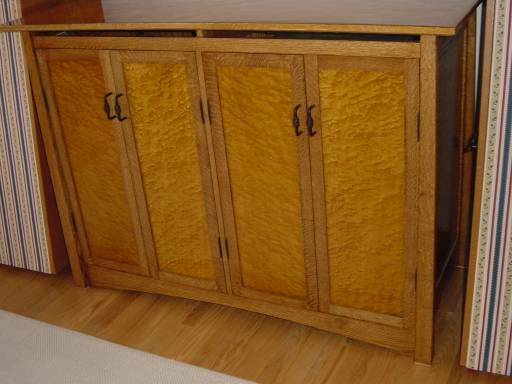 The door and end panels have birds-eye maple veneer. The top is a multi-part veneered panel. The field is an 8 way match of maple burl. Border stringing is curly english sycamore and black walnut. The cross banding border is curly ash. The frame is dyed and stained. The base dye is medium brown Trans-Tint sprayed on. 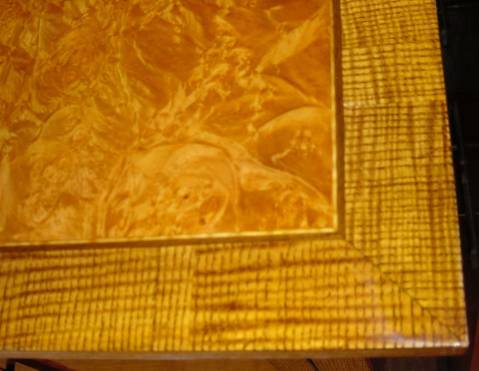 The veneer is stained with Min-wax Golden Oak. Finish is blond shellac. The top was challenging. 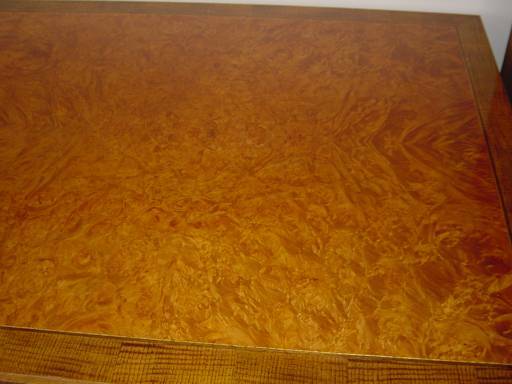 The maple burl sheets do not lie flat and the 8 way match requires considerable care in squaring up the sheets and alignment. The top was too large for my old veneer bag and required making a new one ($30 of vinyl). Once the field was in place, the edges were routed back to prepare for the stringing and cross banding. The stringing and cross banidng were then fitted up and pressed in two passes. Two passes were required due to just having so many linear feet of veneer and it was hard to keep flat after being wetted out with glue. The cabinet was completed June '06.